Beyond Farmville – the Best Facebook Apps. 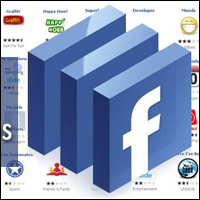 The product of Facebook app development can be a mixed bag. There are a few rather annoying ones, as you may have noticed, and it’s important to check your app permissions each time you install one, to make sure it’s not posting your every move on your news feed. That said, if you’re selective, there are a nifty few of the best Facebook apps that will make your life easier, as well as some awesome business apps to make business social media campaigns a breeze. Do you need to send a file attachment to a friend on Facebook? You can now do it via Facebook’s messaging system but Filefly lets you not only share but also collaborate. It lets you create a folder, upload any files you need to share, and share the folder with your friend. The folders do have a shelf-life, though. They expire after 30 days. Having your Tweets post automatically on Facebook is handy, but if you use Twitter a lot, you might not want every single Tweet clogging up friends’ news feeds. With this app, just tag your Tweet #fb, and it will post as your Facebook status. This is a very useful little tool as it plugs straight into Facebook and, with its Flash-based interface, actually allows you to edit photos within the site itself. This could be a good one for editing those unflattering pictures that your friends insist on tagging you in. For organisation and business social media campaigns, Facebook’s built-in polls and surveys can be a bit limited and clunky. A better way to get your followers’ opinions is to use the Survey Monkey app, which allows for a clearer interface, and lets you keep your survey at the top of your page, if you wish, rather than having it slide down the news feed. More of a set of business apps than a single app, there are several options which let you create contact forms email sign-ups and contact lists, creating a professional feel and helping you to increase your newsletter database. Contapps, Contact Tab and Mailchimp all have Facebook apps. So, those are a few of my favourite Facebook apps, and I hope they’ve shown that apps don’t have to be annoying. In fact, if you’re using social media for business, careful use of a few well-chosen apps can add a level of professionalism and get you noticed as a bright and shiny new hothouse flower amongst a rather overgrown social media jungle.